The DTMF project implements a DTMF detection algoritm for the STMicroelectronics STM32F103RB device. 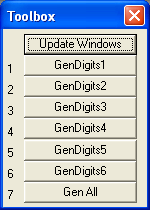 The Simulator target uses signal functions (defined in the debugger init file Debugger.INI) to generate various DTMF signal patters. 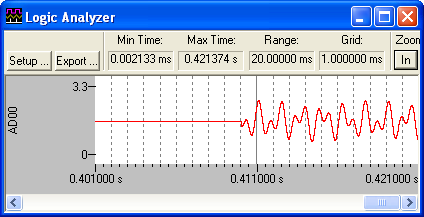 The signal function can be invoked with various parameters using the Toolbox buttons. 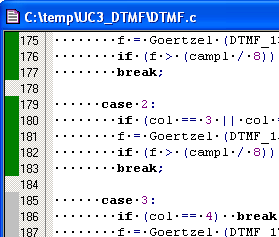 Use View - Logic Analyzer Window to see the DTMF input that is generated on the ADC1 input of the STM32F103RB device. Applications require today a high-level of program verification and algorithm testing. 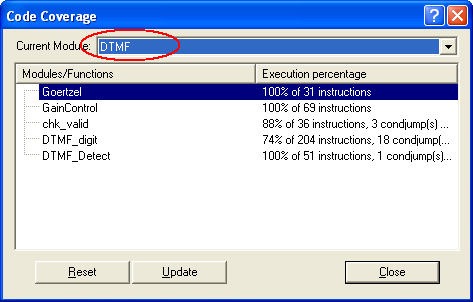 With View - Code Coverage Window you may check that all paths of DTMF algorithm are executed. This is useful during program verification and helps you even to identify redundant code in a program. You may select the module that you want to verify. When you execute the various test DTMF patterns from the Toolbox, you will see that most of the algorithm is executed. 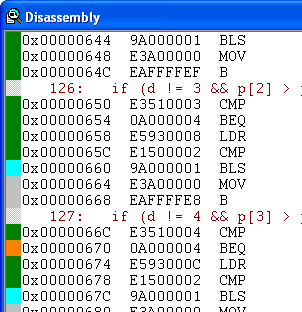 You may open Editor or Disassembly windows to view the Code Coverage recording in detail. he AutoTest target can be invoked with the batch file AutoTest.BAT which starts the debug mode of uVision. The debugger init file AutoTest.INI executes automatically the DTMF signal functions and creates a log file of the program execution.